When discussing with Mathieu Virbel about the possibilities of implementing layering system in NUIPaint, he introduced me to this world of Design patterns. He gave this Wikipedia link and asked me to identify the pattern which is similar to the layer system I thought about. Even though I had a idea about implementing layering system, I failed to identify the right pattern. He then directed me to this pattern called Facade. Voila its was very similar to the structure I had in my mind. Then I realized how important it is to learn this important concept of Design Patterns eventhough I had heard the name in college 😛 I had never given much interest to it. Now I realise its potential. So i planned to implement three main classes. 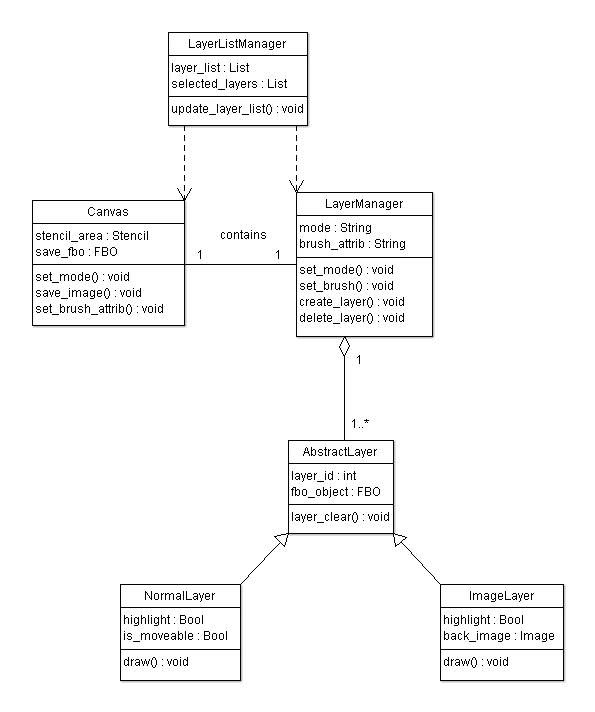 Layer Manager Class ( FACADE ): This class maintains the creation and deletion of the layers. It also maintains a list of layers currently available, number of layers in list. Layer: Basic Unit of Layer, which draws itself and handles touch input. This method of using layer manager as facade works pretty well. Next problem was to create a UI for accessing the Layer Manager features like creation of layers, deletion of layers and even handling layer sorting. So I implemented a new class called LayerList Manager. This class provides UI to create new layers, delete multiple layers in a form of kinetic scrolling list.